It’s late in Super Bowl LIII this Sunday. The driving New England Patriots, favoured by a field goal, have a three-point lead in the game. Hundreds of millions of dollars worldwide ride on whether the Rams can hold them out of the end zone or whether Brady will push it in for a dagger shot to the under-three bettors. Millions more ride on Brady as MVP of the game. Yes, it’s the week of SB LIII and every fan in the country wants to know… how long will it take Gladys Knight to sing the Stars Spangled Banner (+/- 1:50)? Will one of the Pips join her onstage? (Yes +300 / No -500) ? Will she wear a pant suit or a dress (Dress/Skirt -200/ Pants/Shorts +150 )? Will Adam Levine of Maroon Five wear a hat as he appears in the halftime show (Yes +200/ No -300 )? What colour shoes will Levine be wearing (White 6/5/ Black 3/1 / Brown 7/1/ Blue 10/1 / Red 10/1 / Orange 12/1/ Yellow 12/1 / Purple 20/1 /Pink 25/1)? What makes this year’s Super Bowl props significant is that they appear for the first since the U.S. Supreme Court paved the way for states other than Nevada to legalize sports betting. Till now, American bettors had to visit Nevada to make a legal bet or to employ the services of an illegal bookmaker. Online betting has been prohibited till now. As Canadians discovered when marijuana sales were legalized, the SCOTUS decision didn’t mean instant betting everywhere. So far, Mississippi, New Jersey, Pennsylvania, West Virginia, Delaware and, this week, New York state have legalized sports betting. With the New Jersey handle touching at over a billion dollars in the Super Bowl month of February, it’s clear that betting is a godsend for cash-strapped states. It’s about to become a case of get with it or get left behind. That’s what happened to New York, which saw bordering states Pennsylvania and New Jersey snapping up betting revenues that should have been theirs. No brainer. Meanwhile, much of Las Vegas’ riches come from neighbouring California. It’s only a matter of time till the domino effect sweeps the United States. Okay, Europe has had legalized sports betting decades and the wheels are still on. What’s unique in North America? First, for Canada, border states like New York offering full-services betting are going to make Canada’s puny system antiquated overnight. Using both in-person sales at casinos and race tracks plus online apps, the new Americans outlets stand to take a large chunk of Canada’s betting revenues. How will Canadian governments deal with the competition? Citizens who resent carbon taxes will allow sin taxes. But if they disappear what takes their place? Or does Canada adopt the American full-on rules? So far, no Canadian public policy maker has spotlighted this issue. The second implication for legalized betting can be seen in the disastrous PI non-call in last week’s NFC Championship game. The failure to fire a flag has resulted in lawsuits from New Orleans fans and calls to fire NFL administrators. To call it a black eye is to diminish black eyes. The bookmakers, too, were put in an uncomfortable position denying bets on what they knew to be a wrong call. (One book offered credits to seething Saints fans, but they were the only house to do so.) Tying themselves to a league that can’t get it right impugns the integrity of their product, too. Especially when that league is opening up live betting in its stadiums. While leagues are not going to share in the handle from betting on their games they are rushing to make lucrative promotional deals with casinos and resorts that feature betting on them. Now, instead of fans angry at the NFL and its wayward refereeing standards, we will have the customer mad at the partner of that league who just swallowed up his money. It was fine for the ancient Gentlemen’s Club that runs the NFL to have people mad at them. They’re rich. No one likes them to start with. But for them to cast shade on their partners because they can’t administer the game properly is another matter.Controversy sells for the TV networks, but MGM is not in the business of angry clients. Finally, the greater dissemination of public information about point spreads, over/unders, teasers and parlays is going to challenge broadcasters. 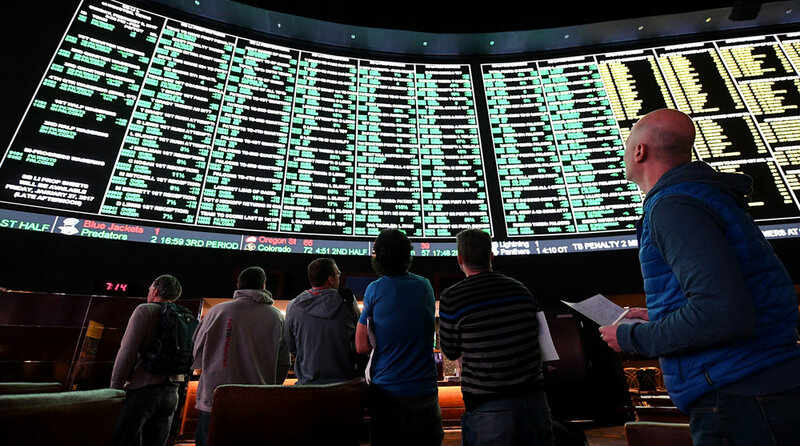 With billions now being bet legally on sports in establishments they partner with, the simple outcome of the game will not be the only story any more. We get back to the scenario at the top of this column. The storylines of who covers are the great untold story at the moment. With millions riding on late scores or goal-line stands will networks play the dummy? How will they monitor the action of their partners in the gambling industry? For conventional media, the first response will be silence. (CBS has announced it will not discuss the odds during Sunday’s telecast until more states get involved.) But someone is going to acknowledge the elephant in the stadium soon. The dam will break, probably with Al Michaels. Integrating betting into the broadcast will become a de rigeur sponsorship opportunity. So enjoy Jim Nantz pretending he can’t see the obvious this Sunday. It may be the last time a Super Bowl treats bettors like streakers. Seen and not heard.